When I retire from teaching, my plan is to play and write about golf full time. It is likely the goal –sans the writing — of many millions. But what do tour players do when they retire? In their working careers they have been doing what the rest of us dream of in our retirement. Earnings pocketed, do they kick back to play weekday rounds with a group of regulars, then return home to tinker around the house? That scenario seems unlikely, given that professional athletes generally have the type of personality that craves competition. Still, I’m sure kicking back is tempting. Take the case of Anthony Kim. In 2010, Kim was the world’s number ten ranked golfer. Now, the 28 year old seems poised to permanently retire from the game due to injuries. If reports are true, he will collect on as much as $20 million on an insurance policy if he never picks up a club again. Kim has seemingly dropped off the planet, and even old friends have heard little from him. Various internet rumors place Kim at nightclubs and casinos, tooling around in a Rolls Royce. Who knows? He might be stoking his competitive fires by playing the latest slot games at Royal Vegas. Like Kim, Bobby Jones famously retired from competitive golf at age 28. Unlike Kim, however, he was at the height of his golfing powers. Jones made a few instructional films and then settled into a life as a lawyer and businessman. Jones also started a little golf club in Augusta. You may have have heard of it. Similarly, Byron Nelson retired at age 34, having accumulated enough money to achieve his dream of buying a ranch. Keeping connected with golf, Nelson spend much of his later years mentoring young golfers, including Ken Venturi and Tom Watson. Jones and Nelson were the exceptions, though. Competitive golfers of any significant stature now can continue to play on into their 50s, transitioning from the regular PGA TOUR to the Champions Tour. For these players, actual retirement might not come until they reach the age of 60 or more. Even as their competitive careers wane, though, many pro golfers already are moving on with the next phase of their lives. The choice to become an entrepreneur makes a lot of sense for many. Tour players already operate small business empires, managing their own schedules, travel, accommodations and staff, while seeking endorsement and sponsorship revenues. It is probably safe to say that Tour players earn as much — if not more — off the course than on. While golfers had long endorsed products during and even after their careers, Arnold Palmer was perhaps the first golfer to turn his golf popularity into a major corporation. 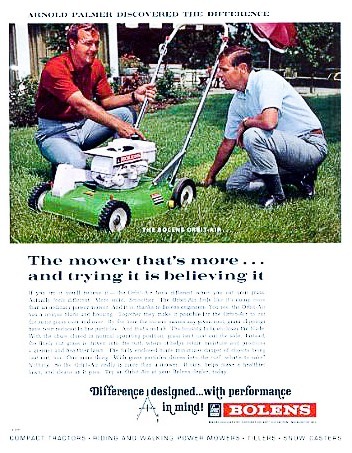 Under the multi-colored umbrella logo, Palmer licensed an enormous number of products and business, including apparel, motor oil, lawn mowers, and a chain of dry cleaners. He also has an active business designing and managing courses. Jack Nicklaus and Gary Player followed similar paths. Billy Casper established Billy Casper Golf and Buffalo Communications, companies which provide support and infrastructure to golf operations. Smaller scale businesses also attract players. Former LPGA player Emilee Klein, for example, works as an insurance agent for State Farm. Jim Ahern founded Executive Golf Ltd., a golf concierge firm that arranges weekend golf instruction retreats for Fortune 500 clients. 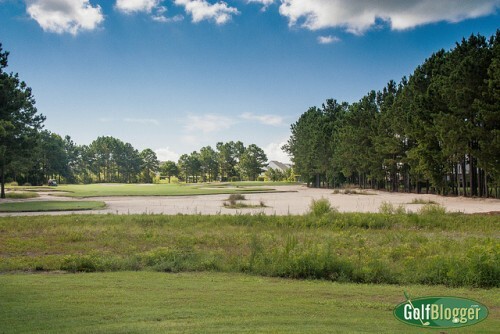 The Greg Norman design course at Barefoot Landing in South Carolina. Golf course design attracts a large number of retired or semi-retired players, including Tom Weiskopf, Ben Crenshaw, Raymond Floyd, Nick Faldo, Bob Goalby, Tom Kite, Mark McCumber, Johnny Miller, Jack Nicklaus, Arnold Palmer, Steve Pate, Gary Player and Annika Sorenstam. Aside from the benefit of their golfing experience, courses also gain the cachet of having a TOUR player involved in the development. I’m sure there’s competition in this field, too, as players vie for contracts and prestige. Teaching or becoming a club pro after a competition is a good option for many — especially players who had shorter, or less spectacular careers. It keeps them in contact with the game they love. Rich Barcelo, who competed for fifteen years on the tours, now works as head pro at Bluejack National. James Paschal, who competed on the PGA TOUR in the late 1970s and early 1980s, and then on the Champions Tour, now works as head pro at Gaylord Springs in Nashville. Notable former pros who work as teachers include: Bob Toski, Stan Utley, Dave Stockton, Pia Nilssen, and Mac O’Grady. All of these are on Golf Digest’s Top 50 teachers list. Stockton, for example, has become the Tour players’ go-to guy for short game help. He has a successful line of dvds on the same topic. College coaching beckons to many. Former tour player Casey Martin is the coach of the Oregon Ducks. Martin, you may recall, became famous for his Supreme Court case that allowed him to ride a cart on the PGA TOUR due to a physical disability. TIm Norris, who played on TOUR in the 1980s, coaches Fresno State. Jan Dowling, women’s golf coach at the University of Michigan is a former women’s touring professional. Finally, many former players transition into working as golf reporters, commentators and color analysts. Among the players who have transitioned into this line of work are Johnny Miller, Nick Faldo, Mark Rolfing, David Fenerty, Dottie Pepper, Notah Begay, Roger Maltby, Gary Koch, Gary McCord, Ian Baker-Finch, and Frank Nobilo.